The Stabex LED range of explosion-protected torchlights meets the requirements of the ATEX-Directive 94/9/EG. The torchlights have been conceived for use in Zone 1 and Zone 2. The Stabex mini LED are also suitable for the Zones 21 and 22. 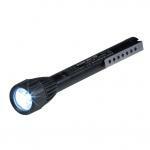 Due to the temperature classification T5/T4 these torchlights can be used in nearly any hazardous area. Because of their compact design, the torches are used for security patrols and inspection duties. The Stabex LED with high-power LED will reach highest light intensity with smallest battery power.